Touch everything once. It’s one of my favorite Maeve’s Method mantras. Dawn Nadeau, entrepreneur and power mom, took on this challenge in 2015 like no one I’ve seen before. Dawn gifted herself six hours of coaching last winter, with the intention of upgrading her home office. Six months, and ten transformational Maeve’s Method sessions later, Dawn emerged having tackled every trouble spot in her home, and her inner self too. 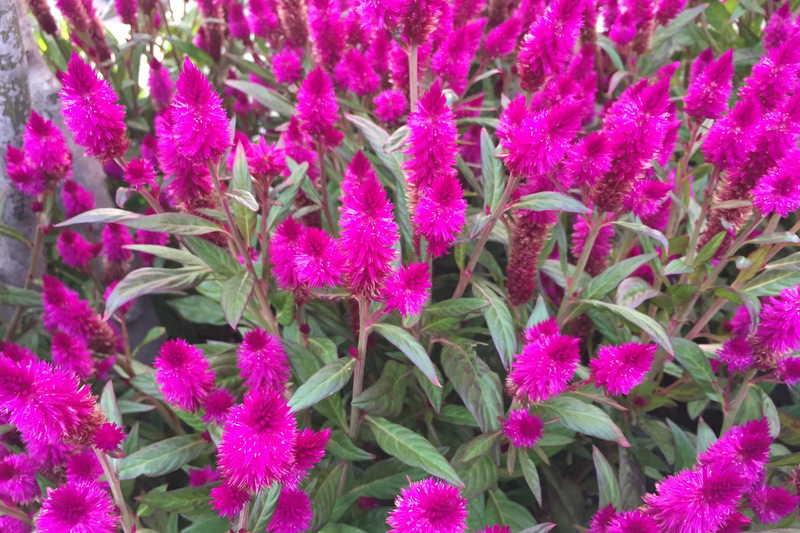 Dawn wrote a beautiful post on her process. We were thrilled when GoodHousekeeping.com took notice and partnered with us to share Dawn’s story on the national stage. 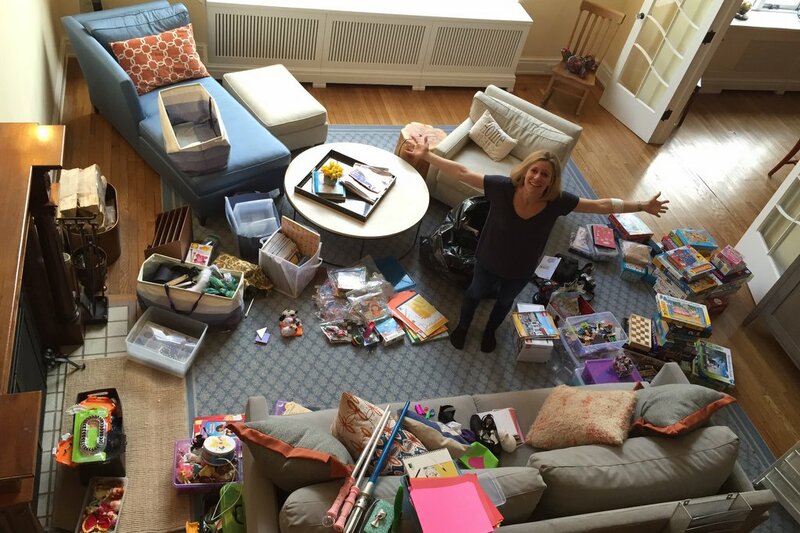 Dawn’s two features How I Totally Changed My Life to Finally Get Organized and 9 New Rules for Decluttering a Kid’s Room – And Keeping It That Way were amazing, and it was a blast do to magazine quality ‘before’ and ‘after’ photoshoots. But for me, Dawn’s journey is best told through tiny moments of insight and success that she achieved during our over 30 hours of work together. 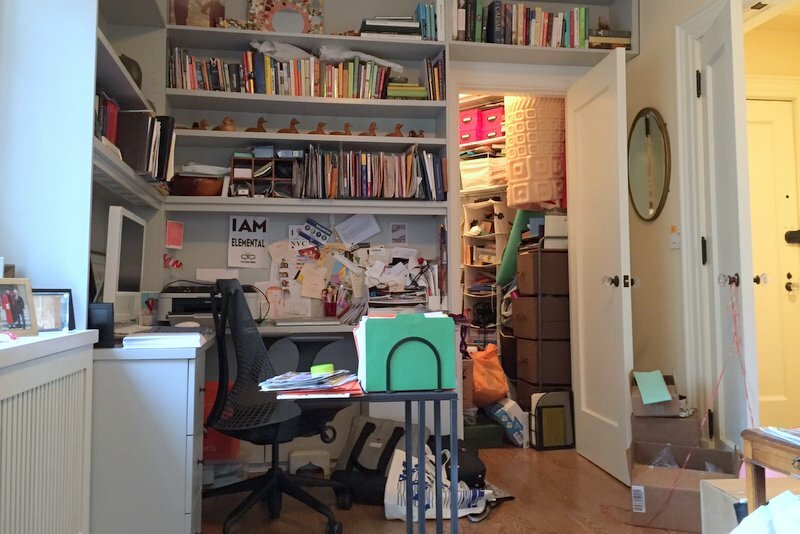 We all love dramatic ‘before’ and ‘after’ photos, but the true magic of getting organized at home comes from looking at the process of how we get from start – to finish. At Maeve’s Method, we call this being ‘In Process’, and it’s a forgiving space when we set our judgements about self and home aside and just get to work. Dawn worked tirelessly over the course of her six month journey. Each session involved the ‘taking apart’ then ‘putting back together again’ of a room or space. This is physical work, and as Dawn shared in her post, it’s emotional too. When we physically connect to our things we connect to our lives as well, to how we make decisions, to what works and what doesn’t work, to where we’ve been – and where we wish to go. Dawn set an intention to no longer be ‘overwhelmed’ by her home, then got to it, room by room, project by project. As you will see, it was an enormous job, but she killed it, and I could not be more proud. Dawn and I began her journey in early January, just after the winter holidays. Dawn had purchased a 6-hour session as a gift to self, to kick off the new year and bring order to her bustling home office. 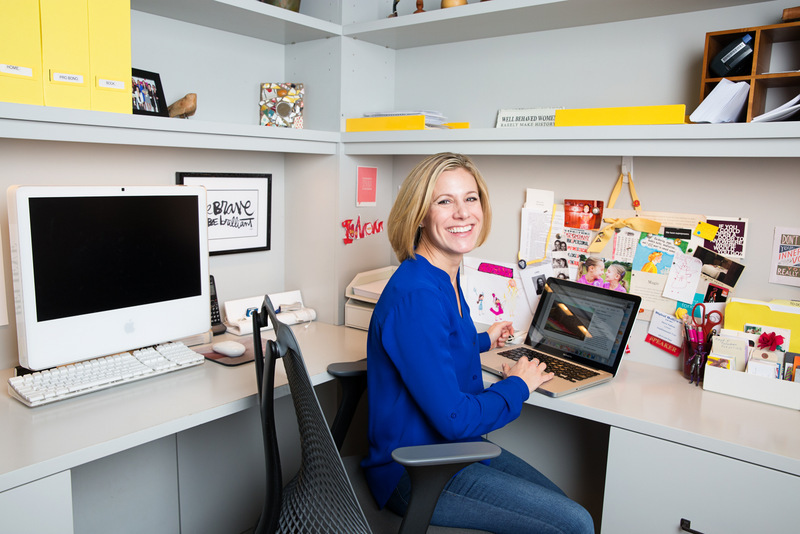 When I arrived at Dawn’s home for her session, I was struck by the open, modern design of her office. But I could also see how it was not working for her. Her office was suffering from what I call ‘volume’ overload. One thing I teach is to allow rooms do what they are designed to do. Just like humans, when we overburden rooms with too many responsibilities, they crash. Dawn’s home office was crashing. It was overloaded with papers, every floor and desktop surface was covered, and extra furniture had been brought in to maximize space. 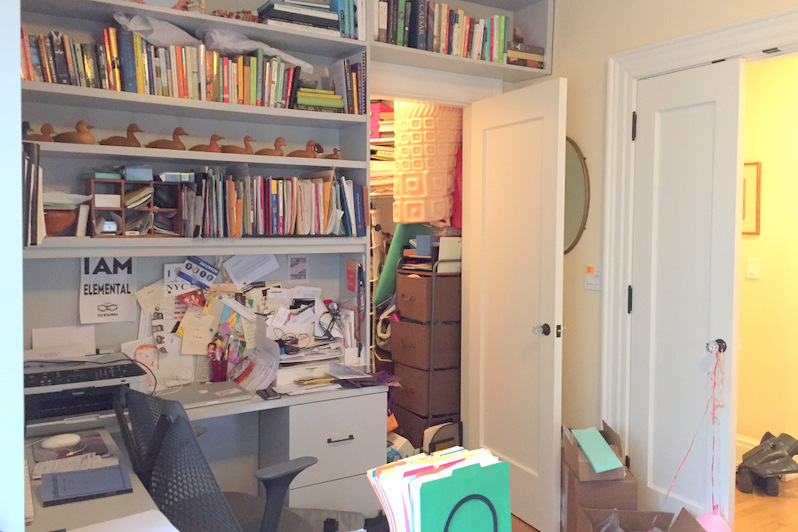 Dawn’s office closet was equally dense, piled floor to ceiling. I asked Dawn, if there were one thing she could change to positively impact her day, what would that be? Dawn said she’d like a place to put her bags, as they get dropped in the middle of the floor as she rushes to manage her family. I love how small changes can make a big impact. Dawn’s need for a place to transition her day, from outside life to inside, and vice versa, was palpable. I was eager to help her work towards this solution. The first thing I teach my clients is how to create ‘categories according to you’. Organization on its most basic level is about putting ‘like things together’. This creates a sense of order, and this is important in life. But how we go about this is paramount. I teach my clients how to find the story of each item. Not the function, or the purpose according to conventional wisdom, but how they use it and what it means to them in their lives. We do this by holding each item one at a time. I ask “tell me about this,” and when I do, the most amazing stories come. Stories of dreams and goals, of work and family, of love and loss. We do this work on the floor, surrounding ourselves with piles of ‘like things’. The process can feel slow going at first, but five to ten items in, patterns surface and the process speeds up. Dawn and I hit the floor on our first day together, and as I handed her items she told stories leading her to personalized categories such as to-do’s, business supplies, daily ‘go to’ things (lip balm, a diary for notes, travel size items), family photos, personal memorabilia, to file, and kids art. We also created a pile of ‘in the direction of’ for things that live in other parts of the house that we’d move later, once we were done working for the day. Creating categories is cathartic as it mirrors back to us the themes of our lives. For Dawn, the process was a reality check as to the state of her home office, and the wheels began to turn about what she’d like to change. Once all items from a day’s project are reviewed, we clean down a project area for a fresh start, then begin the process of putting things back in a new world order. Dawn did this with ease. A revelation came when we looked for a home for her daily use or ‘go to’ things. Dawn had built in drawers, and I introduced the idea that she could store her daily use items in the top drawer, or what I call a ‘drop zone’. As Dawn is visual, and prefers to see things out (rather than tucked away), I waited to see what she thought of this idea. To my delight, she loved it. 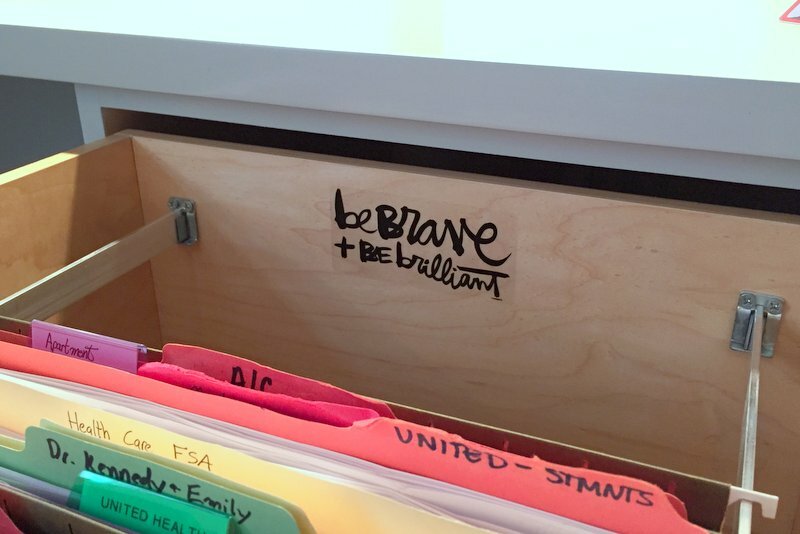 At the top of the next session, Dawn excitedly showed me her re-purposed drawer. As a ‘next step’ Dawn had transformed her top drawer into her a ‘drop zone’ and she loved it. She never could have believed this solution would have worked, and never would have thought to turn a drawer into a ‘drop zone’ for her everyday things, but it was working beautifully. Each day Dawn went in there to get the small bags she needed for the day, then returned them there again when the day was done. It was a private space and moment for herself, and it seemed to ground her. As Dawn spoke, I couldn’t help but notice how nice her office looked. There were no more bags or boxes piled by the door, the desktop was clean and with plenty of open space, the side table was tidy and not overflowing, and Dawn had hung up a few inspiration pieces that she unearthed last we met. Between sessions, Dawn had been busy! Dawn turns the home office into a command central. With the main office cleared, we moved on to the closet. Transforming it was a 6 hour journey, as the space was densely packed, with many of the items paper or small, and with containers filled with many tiny things. We kept a trash bag between us as we worked and Dawn filled it up (along with many others) as she went. 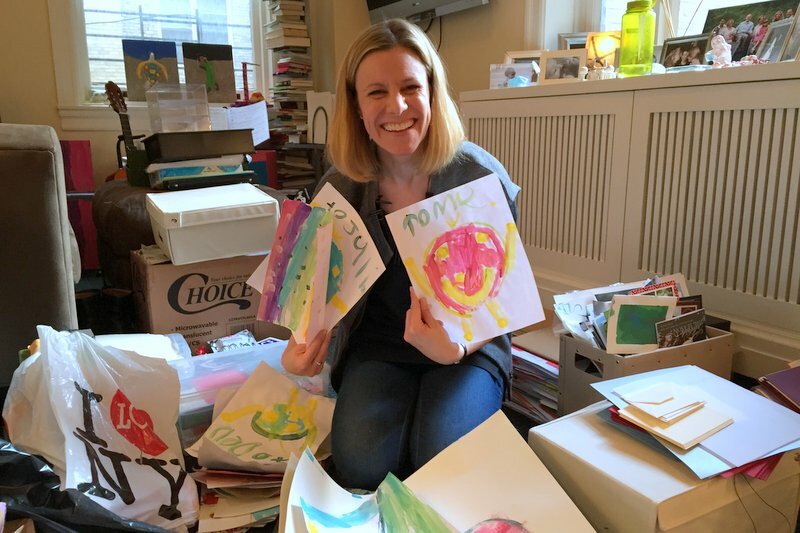 She reviewed a decade’s worth of paper statements, family photo albums, craft and holiday boxes, kids artwork, and several mystery boxes, until the floor was cleared. Dawn tackled huge projects in this space, but the revelation here was as simple as could be. Dawn’s heavy lifting restored the closet to walk-in status and reduced enough volume to free up an entire shelf at waist level. 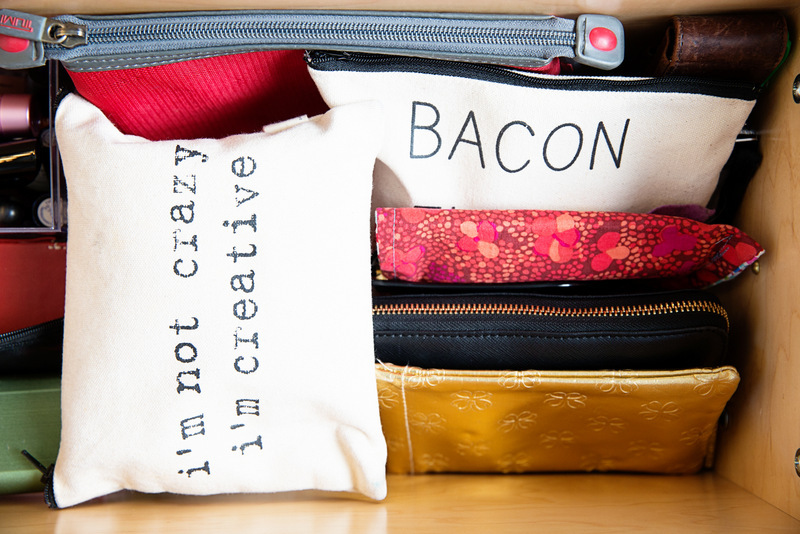 I said to Dawn, what would you think about giving your bags a home on a shelf in the closet, would that work for you? Dawn loved it. 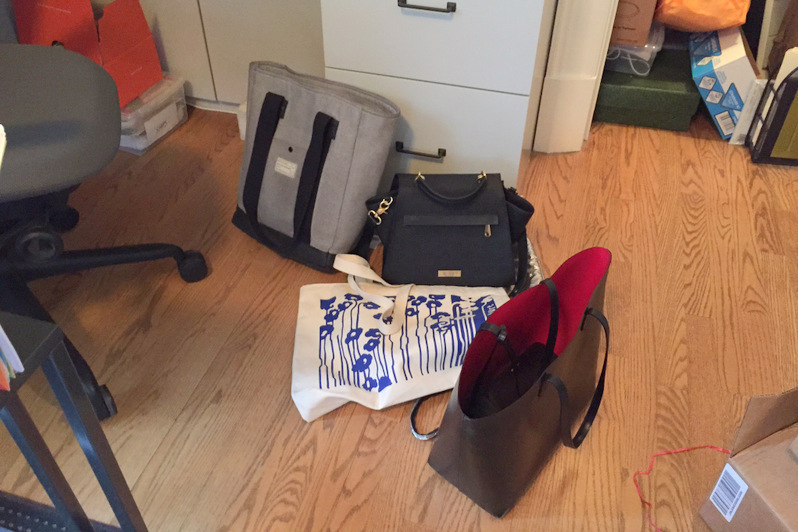 Her journey had come full circle, she had found the ideal home for her bags. We stepped back. All piles had been removed from the floor and placed back into the closet. The job was complete! We closed by bringing four bags of garbage and two pieces of furniture to the garbage room. After twelve hours of determined work, Dawn’s office was significantly improved. It felt airy, the floor and surfaces were clean, and most importantly, Dawn now had easy-to-use systems designed to support her as she moved through her day. 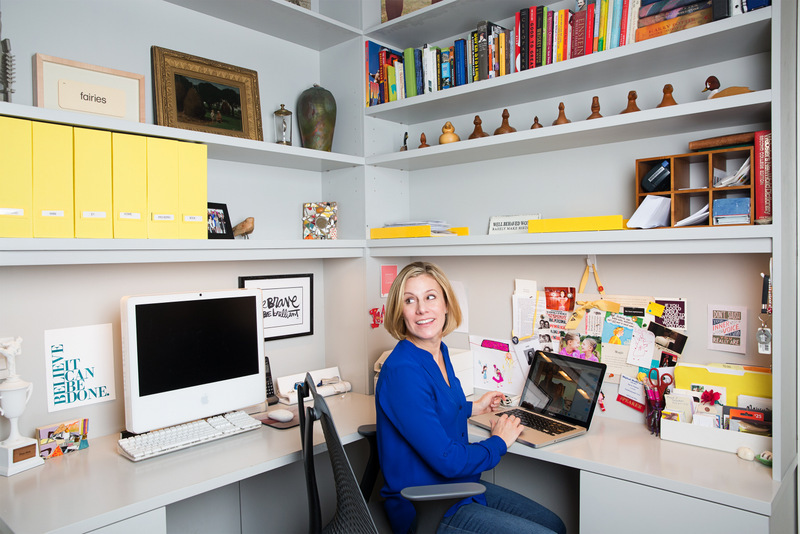 As a special treat, Dawn populated her office with bright yellow office supplies. She was well on her way to her dream office. 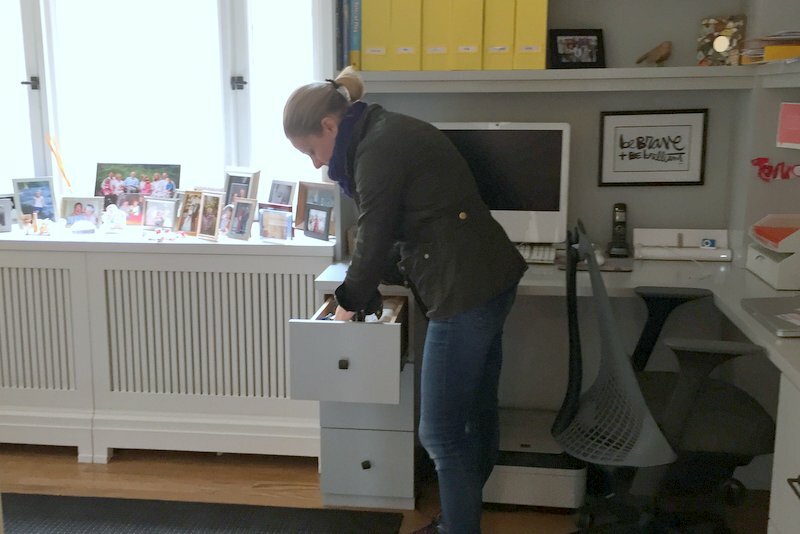 With the office wrapped, Dawn was inspired to start moving room-by-room through her home. She decided it was time to tackle her closets, and we set the intention to take them on, one at at time. 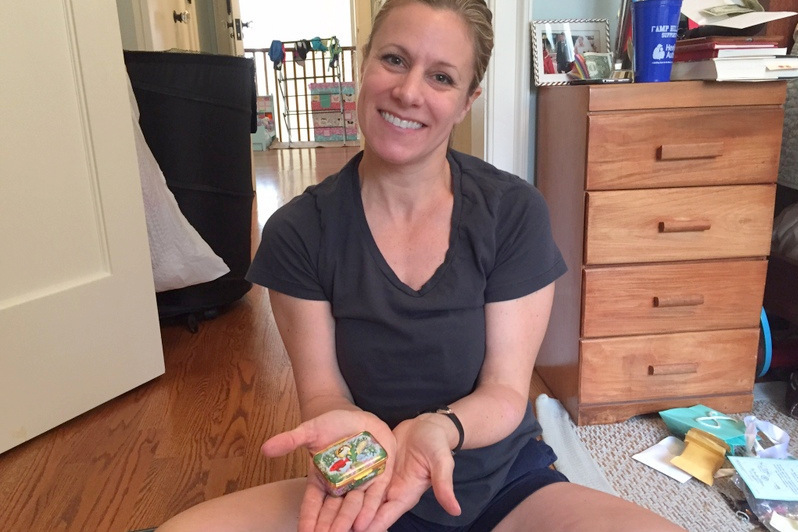 Like any household with kids, Dawn’s home is filled with toys, games, dress up clothes, books, stickers and a wide variety of arts and craft materials. A bulk of these materials lived in a fun closet under the stairs (which I dubbed ‘The Harry Potter Closet’) but toys and playthings also lived in a living room credenza, with a few toys spilling out into the main living area. Before plunging into the closet, we talked about a few options, including how Dawn and her daughter’s used the space. The space is low and they can all fit in, but only Dawn goes to the back because the girls don’t like to go too deep in. The closet ‘before’ was dense with shelving on both walls and all over the floor. It felt impenetrable and uninviting, so I suggested freeing one wall completely, then removing some of the shelving to open the space so they can enter fully, like a treehouse or fort. Dawn loved this idea, and in the end, we turned this back into a walk-in space so Dawn and her girls could step and and get what they want, then put it back nicely again. Dawn’s revelation was that sometimes, in the effort to make a home “look like a magazine” you miss the functionality. Before, Dawn tucked toys away at night into closed spaces. But with the new walk-in closet, Dawn could encourage her children to tuck their own toys away after playtime, happily maintaining a toy-free look in her living room. Next stop, Dawn’s front hall closet. Dawn expressed that she was scared about this project. She knows we always ‘get the job done’, but was having a hard time seeing how this one would play out. 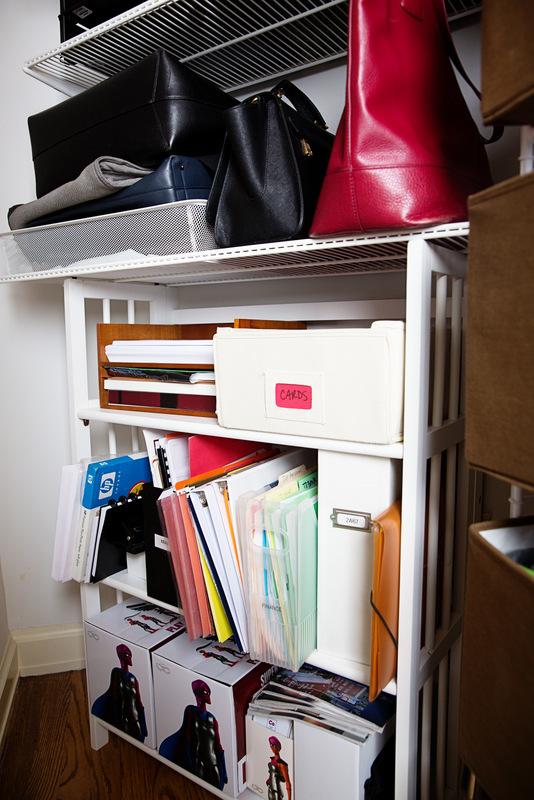 It was the hardest working closet in her home, with ‘in use’ items stacked from floor to ceiling, and she was concerned whether our process would make a difference at all. We got hands on, and soon enough Dawn’s categories began to form, items like sports equipment, family hats and scarves, winter coats and lighter spring coats, winter and summer shoes, for both the adults and kids. 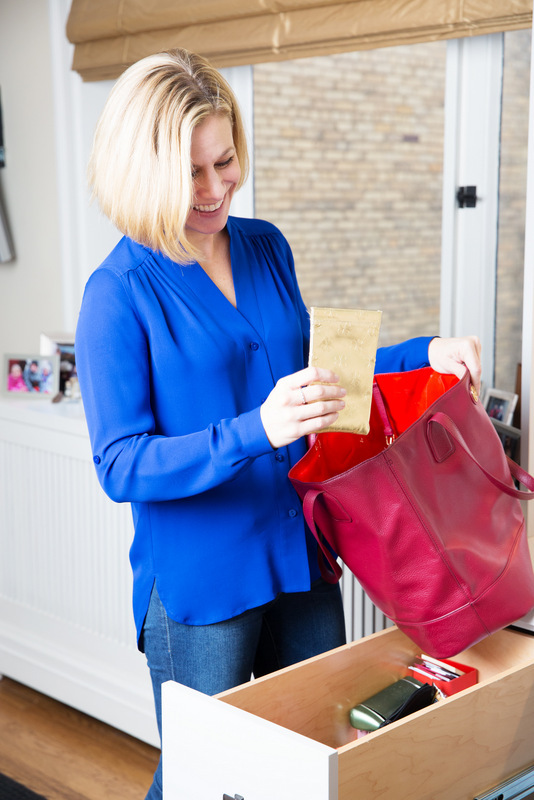 The biggest surprise to Dawn was how many items in the closet she was ready to part with. As we worked, her ‘give away’ pile grew and grew. As a coach, I wait for these moments, as I know reducing volume will translate into breathable space in a previously crowded closet, and this alone would make the time spent worth the effort. Dawn delighted in re-evaluating her over the door organizers. She made great use of them before, but this time she put each item back with intention, making sure to place items in ‘homes’ that made sense to her. At the end of a closet session I always speak to my clients about matching hangers. This is a fine detail that packs a big punch. 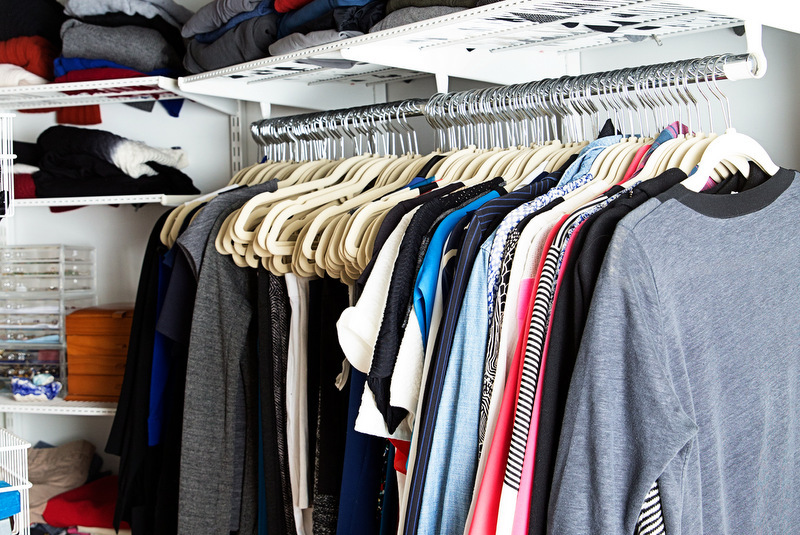 With mismatched hangers clothing hangs at different heights and is spaced unevenly. This causes clothes to bunch, making it impossible to see options, and we end up wearing only a fraction of what we own. Dawn was open and excited to make this change, as it registered that matching hangers would create a clean and beautiful looking closet that she’d be motivated to keep up. 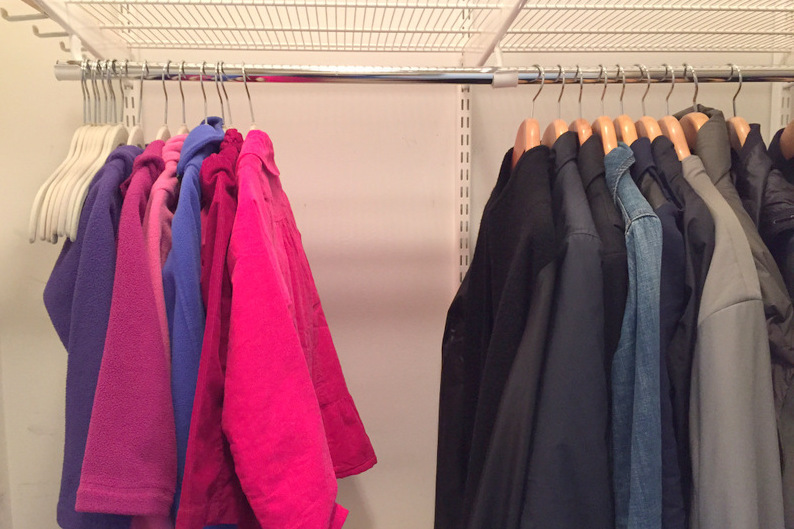 We agreed on a two hanger system, placing kids coats on light, thin hangers, while the adult coats went on heavier, wooden hangers, and began the process of swapping hangers out. Towards the end of the process I stepped into the kitchen for moment, and as I came back I heard Dawn exclaim, “Now I feel like I need to get rid of a coat!” We laughed. She was one “good” hanger short! In the end, she found what she needed in another closet. With everything back, I closed the closet doors, had Dawn stand in front, close her eyes and take a deep breath. She then opened the doors and was stunned at the transformation. Honestly, I was too! 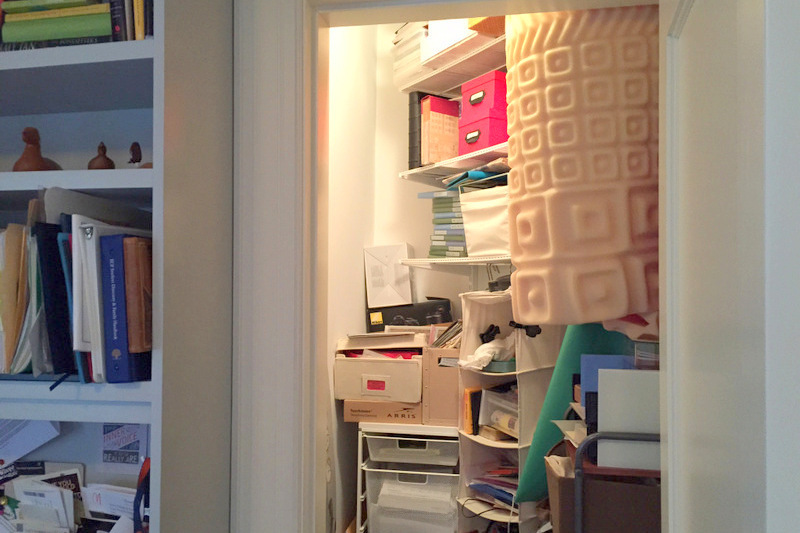 The closet had incredible room to breathe, felt light and airy, and almost empty. This was a rewarding project. Dawn began apprehensive, but by the time we wrapped up her energy was through the roof, and she had created two bags of trash and her give-away pile was enormous. Dawn pares down and streamlines the family closets. As we wrapped that day Dawn mentioned she might be ready to blog about the psycho-spiral that occurs in people’s minds at they get organized in life. How they want to do better, they work to make change, they slip back, then surge forward again, and how this process takes so much more time than anyone thinks. I suggested we do this together, and to my delight, she said yes! With three closets down, Dawn was ready to take on her last downstairs challenge, a deep utility closet underneath the stairs, and we jumped right in. This was closet held a different energy, as it was filled with household and holiday supplies, hardware and tools, cleaning tools, and sports equipment overflow. 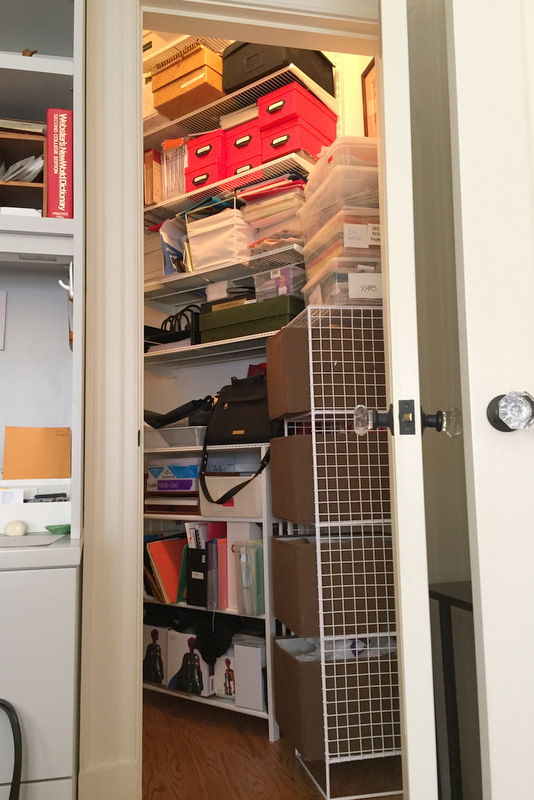 Many of the items in this closet belonged to Dawn’s husband, and were things that he accessed regularly, and she wanted to be mindful as she worked of how he uses the space. As the closet was dense, we deconstructed bit by bit, starting with the items in the front. Dawn began her categories, surprising herself with the discovery of unfinished home projects and aspirations for a rainy day. In the end, Dawn dove deep into the recesses of this space restoring it to its bones, then we built it back up, one shelf and one item at a time, creating an open pathway for walking inside it as we went along. For the third time, Dawn was restoring a closet to ‘walk in’ status, and doing so was adding square footage to her home. She was learning to see her closets as an extension of her main living spaces, and no longer hideaways to stash and store as much as possible, to keep things out of sight. The time had come to move upstairs. 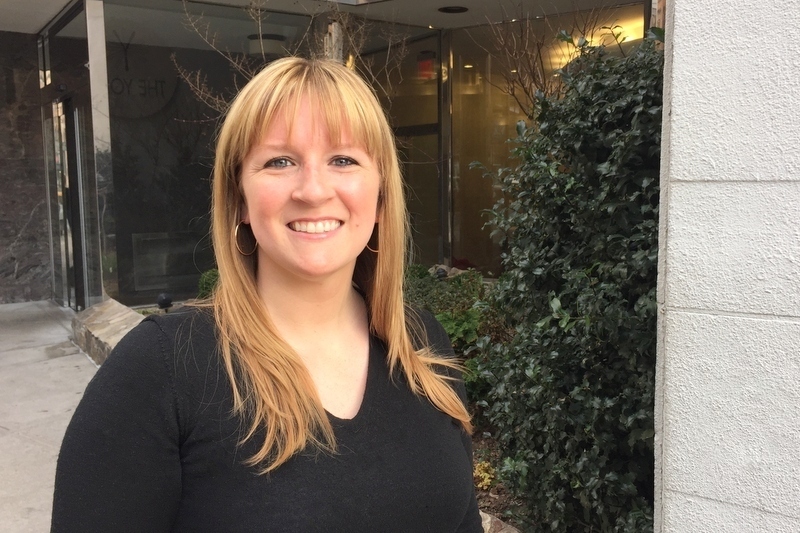 Dawn had masterfully worked through all trouble spots in the downstairs of her home, and was finally ready to take on the family bedrooms, with increased confidence and motivation under her belt. We kicked off Dawn’s bedroom with a deconstruct of her clothes. Dawn handled this like a pro, making quick decisions about what clothes she wanted to keep, and what clothes she was ready to let go. Dawn began to better understand her wardrobe, and it was amazing to watch her honor herself in the area of her home most closely tied to her sense of self. Clothing took up the most real estate in Dawn’s closet, but the magic came in the transformation of a tiny section, deep inside the closet, that held Dawn’s jewelry. Dawn organizes her jewelry and finds a hidden treasure. Dawn was eager to reconnect with jewelry that she loved, but her true intention was to create a welcoming space so that her daughters felt free to explore ‘mom’s jewelry’, just like Dawn got to do when she was a kid. Dawn’s mom had a jewelry box that she was free to both look at and play with, and Dawn wished to re-create this welcoming experience for her daughters. 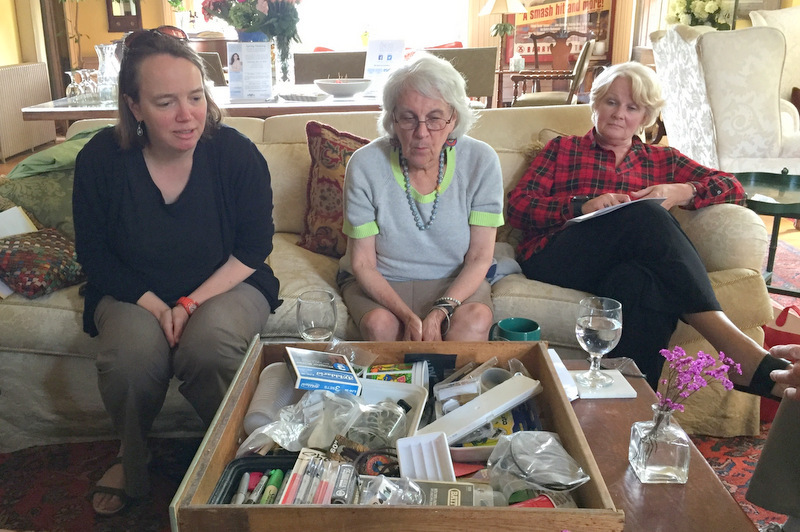 Dawn replaced dark, enclosed boxes with an easy-to-see-through lucite box, and lined her drawers with felt, for a delicate touch, masterfully achieving her goal of creating an easy-to-access jewelry display that her daughters could explore. Just as with the front hall closet, I invited Dawn to introduce matching hangers into her bedroom closet, and she ran with it. Introducing matching hangers into a clothing closet is one of the simplest (and most inexpensive) things anyone can do to transform the home, and I’m so glad she did it. Our final project was at hand. 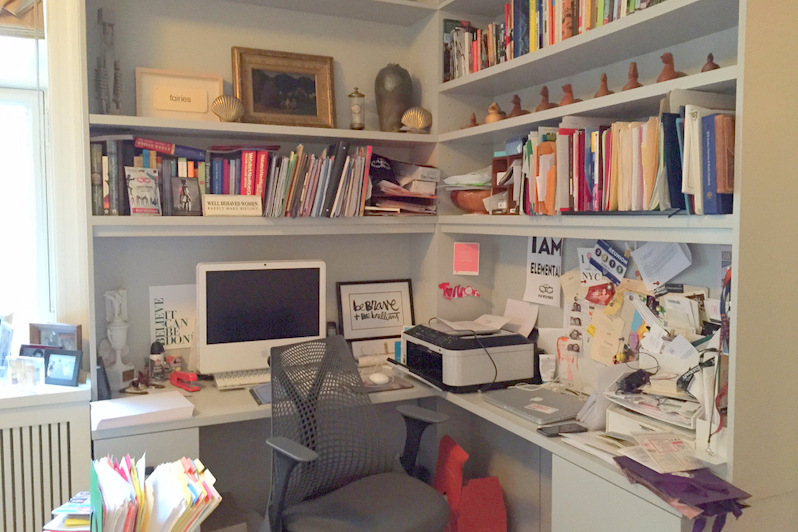 Dawn’s desire to write about her journey to get organized inspired me to reach out to Good Housekeeping, and we arranged to have them shadow us as we conquered Dawn’s final project, her 7-year-old daughter Abigail’s room. Dawn agreed that Abigail needed open space to play, as well as to more easily access her favorite things. She also shared that the tall bookcase in Abigail’s room was hers as a child. 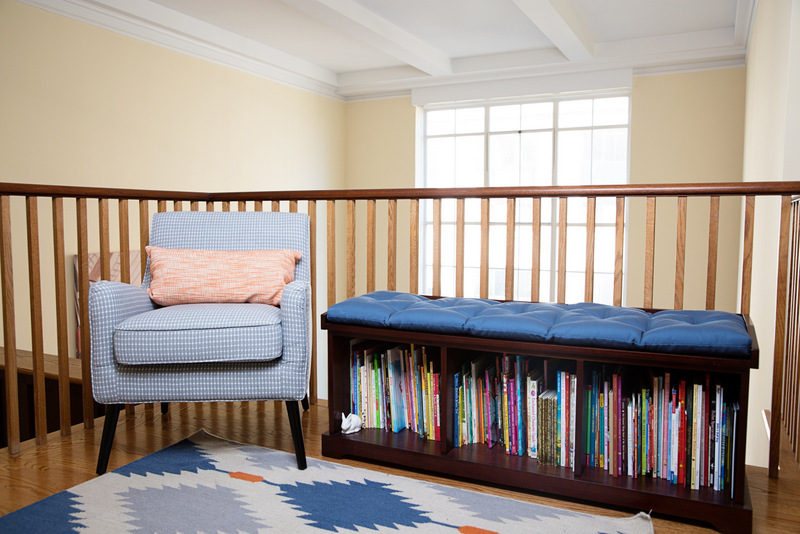 She had long wished to create a cozy reading nook on the second floor landing for her daughter’s to enjoy, and she’d like to move the books out of Abigail’s room altogether, and let the old bookshelf go. Dawn set the intention to reduce volume in the room by up to 30%, and to remove the bookshelf from the room, which had out-served its purpose, and we got to work. In a short stretch, the books were off the shelves and reviewed. We bagged up the donation books, so we could move them out of the room and create space. We then pulled the bookshelf out, and with it off the wall, the room immediately looked larger, bringing a quick smile to Dawn’s face. We moved the bookcase into the hallway laying it on its side, creating a perfect ‘placeholder’ for books until a piece of replacement furniture could be purchased. We then worked our way around the room making sure to hit all of Abigail’s play zones, including the kitchen, her collection of 100 barbie dolls (oh yes!) and a crib holding Abigail’s treasured soft plush toys. We then tackled the desk, and I showed Dawn how to pull the table from the wall to create an intimate space for play and learning, where Abigail could sit by herself or invite her friends. Next I knew Dawn was diving under the bed, grabbing everything she could reach. She emerged covered in dust and with a triumphant smile! This was such a good sign, it showed that Dawn was excited, empowered and motivated to get things done, and would do what it took to make magic happen in the room. Dawn is nearing the end of her journey with me and her new found confidence in making decisions for her home are starting to show. The next day Dawn reported that Abigail was “over the moon” with her new room, that new furniture had been ordered and was on its way, and that Abigail was thrilled to have been included in process. As Dawn and I worked we intentionally set aside items for Abigail to review on her own so that she felt included in her room’s transformation process. A few weeks later Dawn sent me a picture of the family’s new upstairs landing reading nook. It’s fabulous! Dawn worked so incredibly hard on her journey. For me nothing tells the tale more than the amazing smiles I got to see each time we worked. 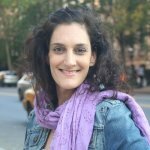 At the close of each session I would check in with Dawn and ask, “So, how does this space feel now?” Dawn’s answers were always positive, but her smiles speak louder than words. You can see her sense of accomplishment over hard work done that day, and I could not be more proud.